A clear sky. Low 59F. Winds SSE at 5 to 10 mph..
A clear sky. Low 59F. Winds SSE at 5 to 10 mph. 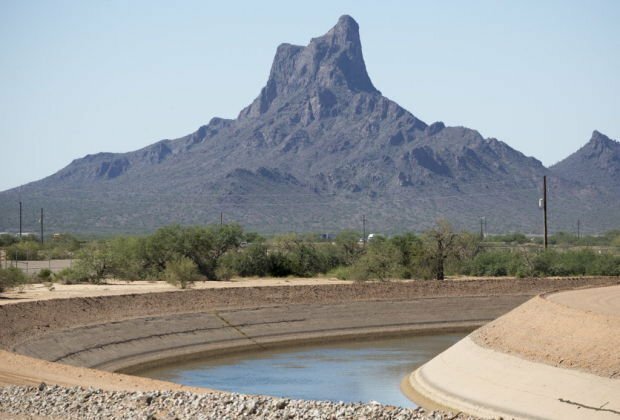 The Central Arizona Project delivers Colorado River water to Tucson and Phoenix via canals like this one at Picacho Peak. The Santa Rosa Canal, near Maricopa, channels Central Arizona Project water to farmland in the Maricopa Stanfield Irrigation and Drainage District of Pinal County. “Everyone will feel pain” was the mantra emanating from supporters of Arizona’s drought plan for the Colorado River as it wound through the Legislature. It is true that under the plan, now embedded in state law, the major water users served by the $4 billion Central Arizona Project — cities, tribes and farms — will all take a hit. But some users will be hurt more, and some will be hurt sooner, than others. Cities will lose the least amount of water and those cuts will not be noticed by their customers. Farms and the tribes will be hit harder, compared to the CAP supplies they get now from the Colorado River. But both groups will get compensation in return — groundwater well subsidies for farms and general financial compensation for the Gila River Indian Community. And all three groups will get some cuts replaced with other water supplies for a few years after river shortages start. Because of a raft of mitigation measures approved in negotiations among the parties, the pain will be less at first and ratchet up over time. CAP water for new development and for recharging into the ground for future use will also be cut. The cuts are needed for Arizona to be able to leave more water in Lake Mead, to prevent the lake from falling so far as to require deeper and more severe cuts than those expected under this drought plan. Legislation allowing the plan to move forward in Arizona passed by wide, bipartisan margins in the House and Senate on Thursday. The cuts take effect as early as next year, if Lake Mead falls low enough — below 1,075 feet at the end of 2019 — for the feds to start cutting water deliveries from the Colorado. There is a 57 percent chance of that happening by then, the U.S. Bureau of Reclamation has said. At that lake level, Arizona will lose 512,000 acre-feet in CAP water a year, about one-third of its total annual supply. When and if the lake drops to 1,025 feet, the cut will top 700,000 acre-feet a year, pushing it closer to half that annual CAP supply. Maricopa County cities. Phoenix-area cities will take a much bigger hit than Tucson to their CAP supplies under this drought plan. It will come in cuts from a CAP pool that used to go to farmers but has in recent years been transferred to cities and tribes. Seven Phoenix-area cities currently get about 52,000 acre-feet of what’s known as non-Indian agricultural CAP water. In the first three years of shortages, those cities including Phoenix face no actual cuts. That’s because the drought plan makes “mitigation” water available from other sources to compensate for the CAP water for this pool that’s left in Lake Mead. From 2023 through 2025, the Maricopa County cities will get 75 percent of that water unless Lake Mead drops below 1,045 feet. Then they get 50 percent. In 2026, or if the lake drops below 1,025 feet before that, they will get no mitigation water. The Phoenix-area cities deliver some of this water to homes and businesses and store some for future use. But they don’t foresee that they’ll have to cut deliveries to any customers under the shortages now forecast, partly because those cities also have access to Salt and Verde river supplies delivered by the Salt River Project utility. Tucson. Tucson Water would lose CAP water when and if the lake falls below 1,045 feet. It gets none of the non-Indian agriculture water delivered to the Phoenix cities but would lose a bit of the main urban supply CAP pool that has higher priority. At that point, Tucson would lose about 6,000 acre-feet of CAP water, or 4 percent of its total supply of more than 140,000 acre-feet. One acre-foot can serve up to four Tucson Water customers for a year. If Mead falls below 1,025 feet, the Tucson utility loses 17,000 acre-feet, or 12 percent of its total CAP supply. Through 2026 at least, the utility expects that these cuts would be replenished by water now stored in the Tucson area by the Arizona Water Banking Authority, a state agency. Because Tucson now recharges at least one-third of its supply every year for future use, cuts of this scale wouldn’t threaten any local water deliveries even without the water bank water, the utility says. Only if Lake Mead were to fall to the 1,000-foot-level or below could the city lose enough water to possibly reduce supplies sent to homes and businesses. Preventing or delaying the time when that will happen is the primary purpose of the drought plan. Farms. Farms will lose more water than cities due to the drought plan. That’s no surprise because farms have always had a lower priority than cities and tribes for CAP deliveries. But the actual amount to be lost proved to be one of the major sources of controversy during discussions over the drought plan. Last year, six irrigation districts in Pinal and Maricopa counties received 250,000 acre-feet of CAP water. That water came from what was left over after cities and tribes took and bought all they wanted. As the drought plan was first conceived, farms would lose all that water once Mead fell below 1,075 and the first shortage was declared. They protested, and after much debate were able to get 105,000 acre-feet a year for three years, starting in 2020, in “mitigation” water. After that, they’ll get no CAP water. But they will get enough financing from the state, the CAP and, the farmers hope, the federal government, to drill enough wells to pump 70,000 acre-feet a year of groundwater. They want $50 million and the state and CAP have fronted more than $20 million so far. With these cuts in hand, these farmers expect to fallow 30 to 40 percent of their fields, their representatives have said. There’s no legal, state limit on the farms’ pumping. But the wells’ capacity will be no more than 70,000 acre-feet. Gila River Indian Community. Headquartered in Sacaton in Pinal County, the Gilas get more CAP water than any other party — 311,000 acre-feet per year. They’ll also lose plenty of CAP water, get $92 million to compensate for some of it, but not enough to make up for the value of the water they’re giving up, tribal officials say. Like the cities and farms, the tribe’s cuts will get stiffer over time. Ultimately, they’ll lose 200,000 acre-feet over the plan’s seven-year life. The Gila tribe will also be giving up additional water separately, for which they’ll get the money in compensation. That will include leaving 350,000 acre-feet in Lake Mead, to help indirectly with mitigating the impacts of CAP cuts to other parties and to help government agencies meet legal obligations to supply CAP water to still other parties. When the $92 million is subtracted from the value of the water the Gilas are losing to cuts under the drought plan, the tribe will lose $30 million to $50 million. That’s money it could have made by leasing that water or selling credits for that water to other parties for future groundwater pumping, said Jason Hauter, a tribal attorney. The cuts and financial losses won’t affect current tribal operations, he said. The lost revenue would have supported a community fund to meet their CAP water’s rising costs and to maintain canals and wells on the reservation. Development. It’s losing Colorado River water under the drought plan. But it’s gaining water under a related deal that wouldn’t have happened without the drought plan. The water being lost is leftover CAP water, that other users with contracts to buy it choose not to buy. It has been sent every year to an agency within CAP that uses it to recharge aquifers. That recharge is supposed to compensate for groundwater pumped for new subdivisions in Tucson and Phoenix-area subdivisions — which is legally required under state water law. About 35,000 acre-feet went for this purpose in 2018 and 15,000 is planned for it this year, CAP records show. When shortages start, that supply will disappear. But thanks to a deal that CAP’s replenishment arm struck with the Gila tribe, additional Colorado River water to the tune of 33,000 acre-feet per year will now be made available for the recharge of aquifers for the next 25 years. The Central Arizona Groundwater Replenishment District, a part of the Central Arizona Water Conservation District that operates CAP, is paying the Gilas $97 million for this water. This arrangement was struck outside the formal negotiations for the Colorado River drought plan. But the Gilas, among the leading advocates for the drought plan, made it clear they wouldn’t OK the water replenishment deal unless the drought plan was approved. The tribal signoff occurred Thursday — automatically, leaders said, right after the Legislature passed its drought plan bills. More cuts to groundwater recharge. The Arizona Water Banking Authority has over the last two decades recharged more than 3.6 million acre-feet of river water into the ground, to be used when needed during future shortages. Last year, the authority, a state agency, got 38,000 acre-feet of CAP water for this purpose. Once shortages begin, the authority will get no CAP under the drought plan. Following the money: Arizona's drought contingency plan is shaping up as a pricey water-saving affair. The deal means Arizona must reduce its draw from the Colorado River by up to 700,000 acre feet between now and 2026.